Belly Weights are versatile jig tying components used to add weight anywhere on the hook shank. We developed them early in 2015 and are using them on several prototypes. These are game changers for us, opening up a whole wide range of possibilities for new Buggs. Let me explain. 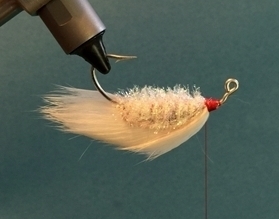 The canvas for jig tyers is the jig head. Jig heads consist of a hook with lead concentrated at the head. Jig heads all tend to fall head first. There's nothing wrong with jig heads. They work really well, but we all know about the effectiveness of flies and lures that fall more evenly. Belly weights give us the ability to tie jigs that will fall more evenly. When I first held them in my hand, about a hundred different ideas popped into my head. All of a sudden, a new canvas! The idea for these weights first came from my desire to tie a slow sinking / suspending mullet imitation to fish in the winter for big trout. Conventional jig heads won't work because the lure needs to be fished slowly. 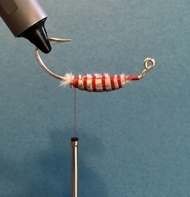 So I went to my fly tying material catalog and found these little tungsten weights called scud / shrimp bodies. They're half oval shaped and have ribs in the side. 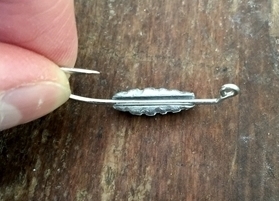 They're made to tie onto a hook shank for weight and to imitate the shape of small freshwater crustaceans. I bought some tungsten weights and they worked as advertised but they didn't weigh enough. They are also really small and I needed some more bulk for the types of lures I wanted to tie. So I started looking for a custom tungsten mold to make bigger and heavier weights. What I quickly learned was that tungsten is a lot more complicated to work with than lead. The melting temperature is a lot higher and the mold costs are astronomical! That was certainly a roadblock, but it was quick answer and it sent me down the road. Then I contacted a local casting company about making me some belly weights out of lead. I sent samples of the tungsten weights along with specifications for the belly weights I wanted. A couple of weeks later the samples showed up and they were spot on! I held them in my hand and my brain went in about a hundred different directions, visions of all sorts of new Buggs popping into my head. I had to sit down! Not really, but I knew there were lots of things I could do with these weights. And that's where I'm at. I'm working on something, and I'll hint at it later, but it's not in production. In the meantime I know there are tyers out there that will enjoy working with these weights. So I've already added them to the online store along with some strong and versatile jig hooks that you can tie with. Have a look below at the tungsten weights on the left that inspired the new Buggs Belly Weights on the right! We started with two sizes of belly weights. The 1/16th oz. version is 5/8" long and the 1/8 oz. version is 7/8" long. We wanted them to be versatile and so we made a large groove on top where it will fit up against the hook shank. This groove has to be big enough to accommodate large hooks, and these weights will fit hooks up to 6/0. 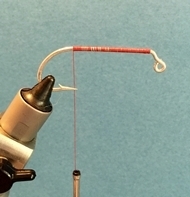 This versatility also means that you have to create a more snug fit when you're tying on smaller hooks. This isn't hard to do, and you'll be able to use some extra materials you have lying around. Here's what I'm talking about. You'll see in the pictures above that the hook shanks are loose when you hold them up to the groove in the belly weights. 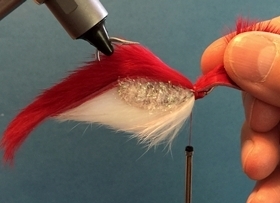 Here's how you make them fit when you're tying on smaller hooks, along with a tying tip. I always have a small jar or plastic cup on the table when I tie. All my trash goes in there, and it doesn't get emptied every day. I tend to accumulate small amounts of materials here, and these can be put to use when working with these weights. Simply tie some material onto the hook shank the same width as the belly weight. Then you'll tie in the weight along the ribs that are in the sides. They hold thread well, and you'll want to tie in a half hitch when you finish in each groove. 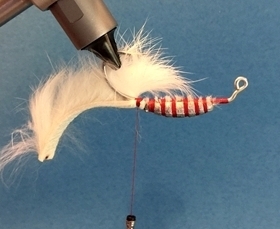 Once your belly weights are tied in, you're ready to tie your own lure. There are lots of possibilities, and I'm going to give you a really simple one to start with. Ever heard of Lefty's Deceiver? 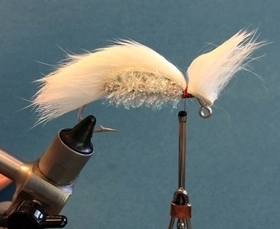 It's a famous fly pattern created by a famous fly fisherman named Lefty Kreh. 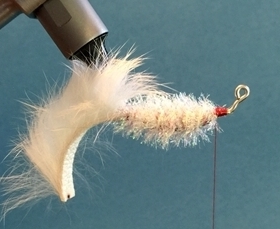 The original fly pattern consists of splayed feathers at the back and bucktail at the head. 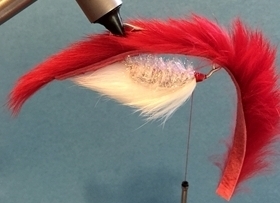 We're going to do a Buggs version for our baitfish imitation tied with a belly weight. Start with the bunny belly technique. You'll see in the pictures that you take the end of the magnum rabbit strip, pull the hairs back, and tie it in right behind the belly weight. Leave it hanging there while you tie in the krystal flash chenille right over the thread wraps you just made for the magnum rabbit strip. Next, cover the belly weight with the krystal flash chenille by wrapping it around the weight. Tie off the krystal flash chenille, cut off the excess, and make some more thread wraps at the end. 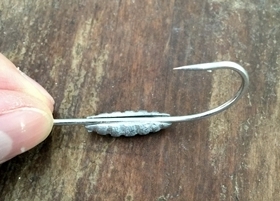 Now you'll pull your magnum belly strip forward and bring it tight along the front of the hook. Where the strip meets the shank, separate the rabbit hairs with your fingers and make four tight wraps of thread. You make these thread wraps tight and they won't loosen on the next step. The next step is cutting the excess magnum belly strip, making several half hitches or one whip finish knot, and covering the end with thread. Now you're going to hold your top magnum strip against the hook and get a rough measurement. What you're looking for here is enough room for the tailing end of your lure to look proportional to a baitfish. 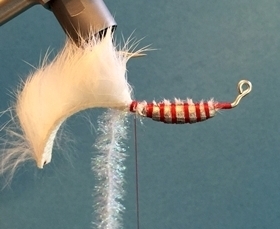 But you don't want it to be too long or it will foul (wrap around your hook and look unnatural). Keep in mind that after you cut your rabbit strip the hairs will extend almost an inch past the hide. Find the place in the rabbit strip where you measured against the hook. You'll now cut a 1/4" slit in the rabbit strip with an x-acto knife. 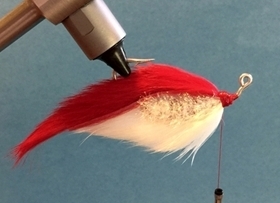 Take the hook out of the vise and slip the rabbit strip over the hook point. Pull it forward toward the eye of the hook. 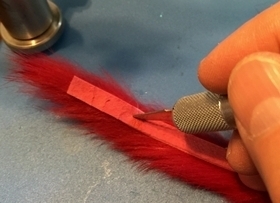 Separate the hairs and make four good thread wraps in the rabbit strip. They'll hold while you cut the end of the rabbit strip. After you cut the strip, make a few more thread wraps and then make a good whip finish knot. Cover the rest of the strip with thread and whip finish again. The final step it to coat the thread wraps with Hard as Hull head cement. If you're a beginner and you've tied this simple baitfish then you've really accomplished something. 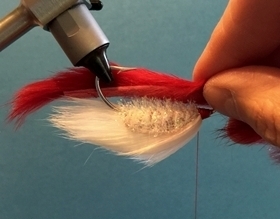 You have all the basic steps, the raw materials, to tie lots of other lures. If you're more experienced then you're probably thinking that the lure is too simple and can be improved. You're correct, but you know it isn't necessary to catch fish. Simple baitfish style soft plastics on plain lead jig heads catch fish every single day on the coast, and that's what you have right here. 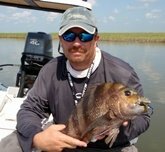 I hope you've enjoyed learning about the new Belly Weights from Buggs Fishing. Like I mentioned above, I'm really excited about using them and already have lots of ideas in mind. Here's what I'm working on and how I got the idea. 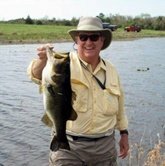 I was introduced to a fly fishing guide and expert fly tyer named Henry Cowen. We had several conversations and he talked to me about designing shad imitations for freshwater striped bass. He have me a great idea for a shad imitation, and I ran with it. The really cool thing is that just about all freshwater gamefish eat shad. 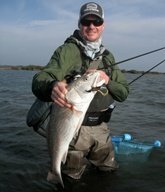 And saltwater fishermen chase redfish, trout, snook and several other species that eat a baitfish called a menhaden. Menhaden are also called shad, and have a very similar shape to the threadfin shad that Henry told me about. So I'm really excited about the lure I'm working on because it has an almost universal appeal. The other thing I'm pumped about is that I've been able to generate some action with this new lure that I didn't think was possible! That's all I'm going to say for now. Until the unveiling of the newest Bugg, I hope you'll join me in tying with these belly weights! 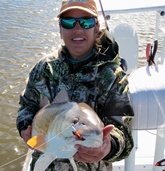 We offer both sizes of the Belly Weights along with a good selection of saltwater jig hooks for you to tie on. In the example above I was tying with the 1/8 oz. belly weight and the 2/0 hooks. I'll share a link below to the page. 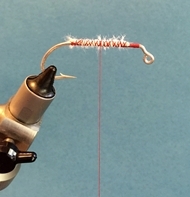 After you've picked out your hooks and weights, go to the home page of the store and look for the rabbit strips, thread, and flash & chenille page for the rest of the items from the example. Click here to see them all.